Hyundai Tiburon was a compact sports coupe manufactured by Hyundai from 1996 to 2008. 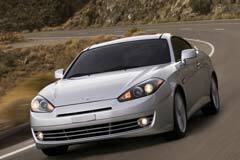 Hyundai Tiburon was also known as the Hyundai Coupe and Tuscani in certain markets. The Tiburon, which means “shark” in Spanish, was released in two generations, the RD and GK. Each generation also saw periodic facelifts. The first generation RD Tiburon was launched in late 1996. It was initially available in a few markets with engine options of 1.6, 1.8 and 2.0 liters. In the U.S., Tiburon was launched in 1997 with 1.8L and 2.0L engine options. In 1999, Tiburon saw major facelift and RD2 Tiburon was introduced. The second generation GK Tiburon was launched in 2002, giving it a completely new styling and much larger dimensions. The second generation was also offered with an optional V6 engine. The second generation Tiburon saw more improvements in 2005 and again later in 2007.